Electric load is returning for U.S. utilities as the country shows signs of emerging from the recession. If anticipated economic growth occurs, there will be a need for new generation. In addition, environmental regulations will cause retirements and retrofits of existing power plants. As utilities plan their futures, they must decide which plants to retrofit, which to retire, and how much new generation is needed. Where is the U.S. power industry headed with these new generation projects? The drivers for power plant technology choices are complex. There’s an old saying in the power industry: “Technology tells you what you can do, economics tell you what you should do, and politics tell you what you will do.” This article will examine power technologies available, the economics associated with each, some of the political factors that affect them, where Black & Veatch thinks the industry is headed, and, ultimately, the potential for insulation work in each case. The world wants plentiful, cheap, sustainable energy that produces no harmful emissions or waste. 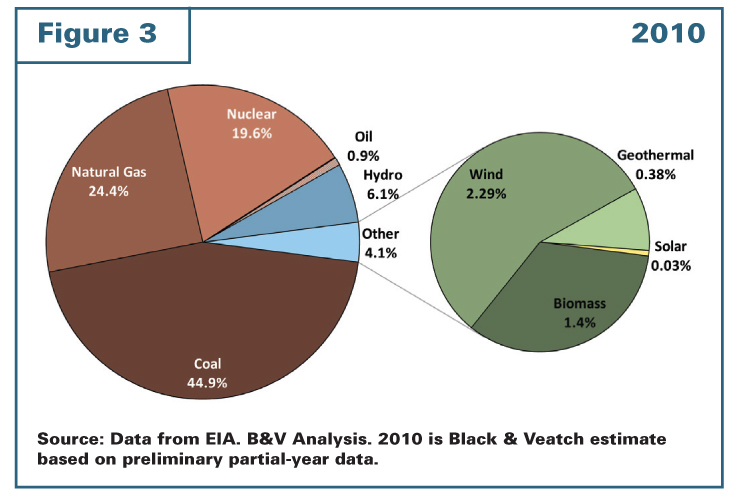 In the United States, in spite of energy conservation measures and increasing efficiencies, electricity demand is expected to increase about 20 percent by 2035.1 Figure 1 shows the current contribution by various fuel sources in the U.S. energy mix and projections for the next 25 years, according to Black & Veatch’s Fall 2010 Energy Market Perspective (Note: A new report will be finalized later this summer, and these estimates are subject to change). Several notable trends are expected in the next quarter century, with renewables showing the biggest percentage increase, as well as an increase in gas-fired plants and decreases in coal. The events in Japan earlier this year will result in a focus on operating nuclear facilities in the near-term; however, Black & Veatch believes that the resiliency of the nuclear industry will ensure that new build activities resume. As we look at the drivers of change in the overall generation mix of the U.S. fleet, which are the most compelling: economics, environment, or operability? For a well-balanced asset portfolio, the answer is that all three must be considered. Installed renewable energy capacity has increased dramatically over the past 10 years, as seen in Figure 2. This has been the result of regulatory and incentive policies. The continued push to install new renewable capacity will have the same drivers, but the probability of a carbon cap mechanism will further increase the cost-competitiveness of renewables. 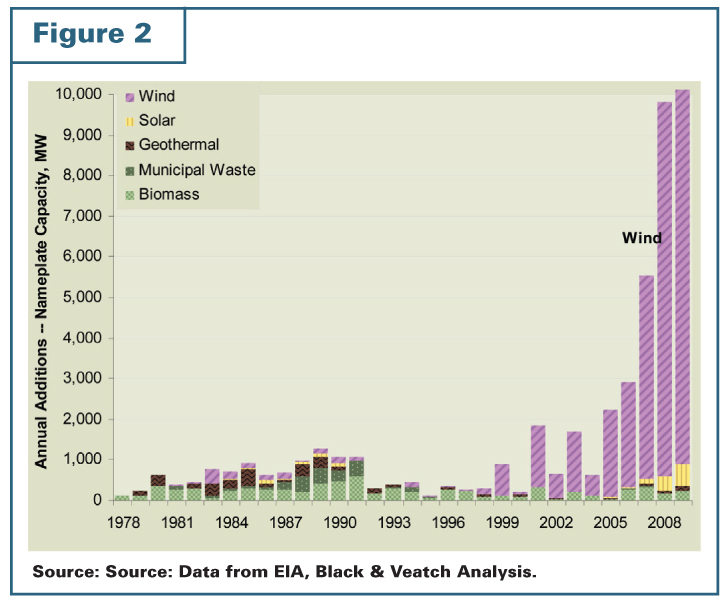 As seen in Figure 3, the installed renewable capacity is predominantly wind. This has been driven by maturing project economics coupled with significant technology advances and incentive policies that made wind competitive with conventional generation alternatives. There are two primary solar technologies: solar photovoltaic (PV) and solar thermal. A solar PV plant comprises a very large array of panels, connected to produce a significant amount of electricity. A solar thermal plant concentrates solar energy to harvest energy as heat. The heat is used to make steam to power a steam turbine. Solar thermal plants are more similar to a conventional fossil-fuel-fired plant when compared to solar PV. Molten salt energy storage systems associated with solar thermal are a commercially viable technology and provide more opportunities for insulation work. difficult to permit. Like wind, tremendous growth has been seen in the solar PV market, as similar manufacturing technology expertise and incentive policies have made PV competitive in peaking power markets. This trend is equally valid in international and domestic markets, although some international markets have grown even more than the U.S. market. As wind and solar will be an increasingly important part of the U.S. energy mix, the industry has recognized the need to mitigate periodic intermittency of the generation from these two technologies. The answers range from transmission upgrades to energy storage to rapid response gas turbines. Each of these potential solutions will be a part of the changing landscape of the electric utility industry. Biomass has traditionally supplied a large portion of the renewable generation in the United States. However, the magnitude of biomass capacity additions is anticipated to be relatively small in the near- to mid-term as compared to those of wind and solar. Regulatory uncertainty has hindered decision making regarding several proposed biomass projects, although several biomass plants are anticipated to come online in each of the next few years. Hydroelectric power is inherently clean, with no direct emissions or waste from the generation of electricity from moving water. There are a number of environmental concerns that may limit development of large hydro projects; however, there may be opportunities for small hydro, run-of-river hydro, and upgrades and retrofits of new hydroelectric generation in existing dams. In its fifth annual Strategic Directions in the Electric Utility Industry survey, in which more than 700 U.S. utility leaders participated, Black & Veatch reported that water supply has become the top environmental concern among survey participants, and water management was rated as the business issue that could have the greatest impact on the utility industry. Geothermal utilizes naturally occurring underground temperature gradient to generate steam and power. For power generation applications in the United States, the available resource is primarily found in the Southwest. Technologies are developing that enable more cost-effective utilization of low-temperature resources. Black & Veatch expects that economically viable projects will continue to be developed in this niche market and be a part of the renewable energy portfolio in the United States. The pace of wind and solar facility projects deployment is accelerating, which will further drive prices down. The push by the government and public opinion will drive subsidies that will help mitigate the cost and will also drive improvements in the technology that will make them more cost-competitive. This improvement in the cost of installed generation will likely be coupled with a cost of carbon emissions for fossil-fueled technologies. The result is that the annual generation from renewables is expected to triple over the next 25 years. As the Energy Market Perspective forecast shows in Figure 1, the United States will continue to depend heavily on coal and gas. The country has plenty of coal reserves, and thanks to cheap, available gas resulting from unconventional sources such as shale gas, the outlook for gas-fired generation is bright. In addition, the United States has its own nuclear fuel supplies. “Altogether, the United States still has the fourth largest deposits of uranium in the world, behind Australia, Canada, and Kazakhstan.”2 The United States does not rank high in uranium production only because the demand has not been there. Coal-fired power plants have been built and operated in the United States since the 1880s. Coal is plentiful, and efficiencies have improved tremendously. Over the last several years, environmental regulations have become increasingly stringent for air emissions and liquid and solid waste disposal. The control technologies exist and are being applied to both new and existing units. As the possibility of a CO2 cap becomes more likely, the economics of coal will change. Capture and sequestration of CO2 presently carry a high price tag. President Obama in his 2011 State of the Union message acknowledged that clean coal would be a necessary part of the United States’ energy mix, at least for the near-term. However, it is not so much the “politics tells you what you will do” part of the axiom that’s driving that; it’s the “economics tells you what you should do.” Low natural gas prices (and moderate equipment prices) make gas plants more economically attractive than coal-fired plants today, with half the CO2 emissions. The long-term market for new coal-fired generation will depend on the commercialization and cost of state-of-the-art technologies, including ultrasupercritical pulverized coal, integrated gasification combined cycle, and carbon capture. If these technologies can be cost-effectively built and operated, and if CO2 prices are low or non-existent, new coal generation may remain viable. In the late ’80s and the ’90s, gas-fired combined cycle plants were the primary choice for new power generation facilities. Gas is a relatively clean-burning fuel, and as long as gas remained inexpensive it was the clear economic choice over coal. In the late ’90s the price of natural gas increased. By the year 2000, high gas prices and an excess of newly built capacity halted construction of most gas-fired plants. In the mid-2000s, most new generation was coal-fueled. Now the pendulum is swinging again. Natural gas prices peaked in 2008, but the development of less-expensive shale gas and the discovery of new reserves have caused prices to drop dramatically. The lower fuel cost, coupled with the fact that a gas-fired plant produces only about half the amount of CO2 that a coal plant of the same size would produce, makes gas-fired combined cycle plants the more attractive alternative again in most cases. Speed to market and operating flexibility are also considerations as gas-fired projects can be completed relatively quickly (coal plants can take up to 4 to 5 years to complete) and started up and shut down to meet demand, particularly when electricity prices are most attractive. Technology advances have made gas-fired generation a good option for firming intermittent wind generation. The goal to reduce greenhouse gas emissions is partially met with gas-fired generation. As President & CEO of Black & Veatch’s energy business Dean Oskvig put it, “Combined cycle gas plants can buy us some time.” But in the drive to achieve a major reduction in global CO2 emissions eventually, nuclear power is also expected to play a role. Steve Rus, Executive Director of Black & Veatch’s nuclear business, predicts a nuclear renaissance in this country. Efficiencies and overall capacities at existing nuclear plants have been improved over the years to near maximum levels, so additional nuclear generating capacity will have to come from new units. No new nuclear plants have been commissioned in the United States since the 1990s. Before the tsunami and earthquakes in Japan, Rus and other industry experts predicted new nuclear plants would start construction in the United States in this decade. This timetable may be delayed, but there are still new nuclear plants in the foreseeable future. Nuclear power is attractive in many ways. Nuclear plants have high power density (high MW production with a relatively small physical footprint), high capacity factor, and a low fuel cost. So although nuclear has a high capital cost, nuclear power can be cheap to generate. In addition, nuclear power is the only source of baseload generation that is free of greenhouse gases. Industry estimates for the cost of a new plant vary from approximately $6,000 to $10,000/kW. The high cost and wide range of variation in cost estimates make nuclear a higher-stake investment than other generation technologies. Safety concerns in the aftermath of Japan’s experience obviously have also recently contributed to investment hesitation. The Nuclear Regulatory Commission has a number of pending applications for new plants (30+ as of this writing). But all of those applications came before the earthquake and tsunami hit Japan. It is difficult to predict at this point when or if those projects will move forward. Nevertheless, the impetus is clearly there for the United States to move forward with new nuclear capacity. The U.S. electric market will experience some large changes over the next 25 years. Gas-fired generation could more than double; renewable generation could triple; and coal generation could fall by nearly half. At the same time, nuclear could make modest gains. Along the way political, environmental, and cost drivers will provide the decision points the industry will look to to help determine the right mix of generation assets. The unique needs of individual utilities will continue to require unique answers to generation planning. Utilities that currently have a lot of older coal units will likely see the largest changes in their portfolios. Utilities that have a lot of gas generation may find a need to diversify their fuel mix. Utilities in states with high renewable portfolio standard requirements may have to find ways to add renewables. “Technology tells us what we can do, economics tell us what we should do, politics tell us what we will do.” Technology tells us that we have many commercial generation options available to us today. Economics tells us gas-fired combined cycle plants are a low-cost baseload or intermediate load choice at present to address power demand as domestic growth resumes, but they are only part of the solution. Politics say renewable and nuclear energy should go a long way to easing CO2 concerns. In the case of nuclear plants, the public and investors must understand that nuclear plants can be built safely and that spent fuel can be managed. What does all of this mean for the possibilities for insulation work? Many wind and solar projects will be designed and built. There is virtually no insulation associated with wind energy, and almost none with solar photovoltaic. It remains to be seen how many solar thermal plants will be built, but there will be some, and they will be very large-scale insulation jobs, with possibly miles of pipe to be insulated. This insulation work will, for the most part, be very similar to that for fossil-fueled plants with a steam cycle. The best news for the mechanical insulation industry is that it can expect to see a lot of combined cycle plant work in the near-term and nuclear plant work farther down the road. The combined cycle work will be familiar in scale and approach. Nuclear plant insulation work is much more challenging than for other technologies. The insulation is an engineered system with pieces specifically designed for each equipment item and pipe segment. The materials must be able to stand up to a radioactive environment in addition to the usual environmental factors. Much of the equipment to be insulated is unfamiliar; the QA requirements are more rigorous; inspections are much more stringent. When the construction of nuclear plants ramps up, there will be significant insulation work, and that work will offer challenges not seen in the United States for 20 years or more. The insulation industry and design/build companies like Black & Veatch must be prepared to work together to meet those challenges. 1. Energy Information Administration Annual Energy Outlook 2011, Energy Consumption by Sector and Source, United States, Reference source (electricity, all sectors). 2. “Will Virginia Be the Catalyst for a U.S. Uranium Reversal of Fortune?” March 8, 2011. Nuclear Townhall (www.nucleartownhall.com, June 7, 2011).